Need a boost? 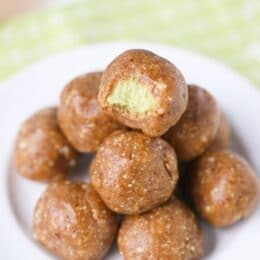 These Key Lime Energy Bites are the yummy boost you and your kids need to get you through busy days! I always start to feel a little weary around 2 in the afternoon. I don’t need a full meal but I need something nutritional to give me a boost. 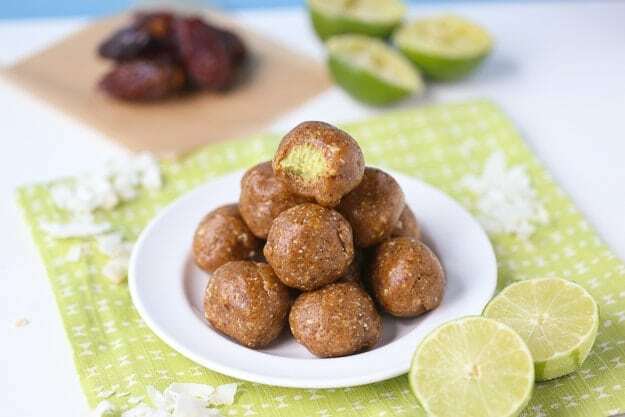 These Key Lime Energy Bites are the perfect thing to reach for, especially in the summer! 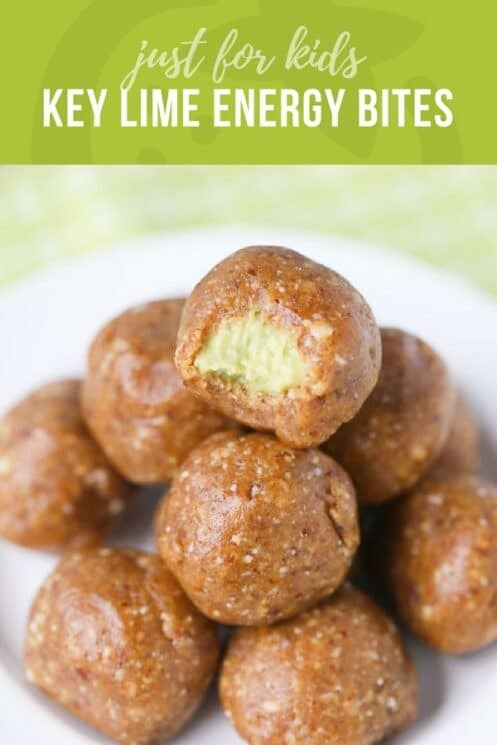 These energy bites have a cool key lime filling, so they’re basically a popsicle when they come out of the freezer. The filling is made with coconut cream, avocado, limes and banana. I ate some of the filling after it was frozen and wow, it’s like lime ice cream! So yummy! I’ll be making these non-stop this summer! 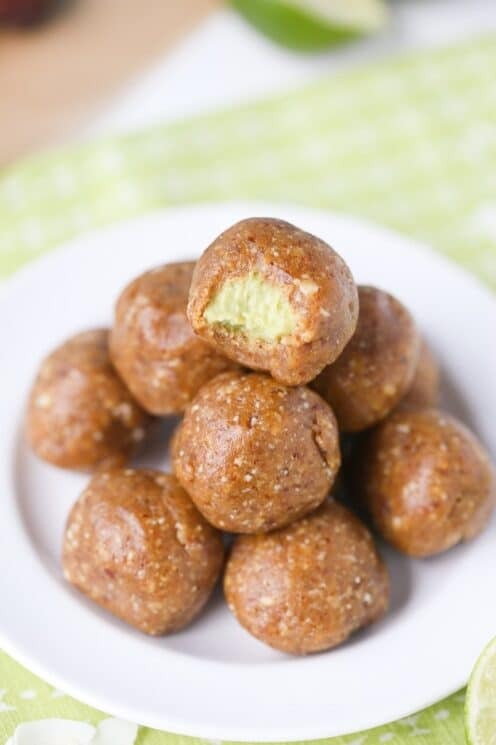 I made the outside and inside of these energy bites in my food processor in just a few minutes. To get the fun effect of them being filled with key lime filling, you need to freeze the filling. This is so fun for the kids to help with because it’s sort of like a craft activity and snack time all rolled into one. Freeze the filling and then scoop out little rounds and freeze them again. Meanwhile, flatten out pieces of the outside layer and then place your key lime filling on top. Wrap the outside layer around the filling until it’s covered. I trimmed off the excess to use for the next energy ball. Pop back into the freezer for another round and they’re ready to eat! How Long Will Energy Bites Last? Instead of reaching for candy or chips when you start to get a little tired in the day, keep some of these in your freezer so you always have something healthy to boost your energy! 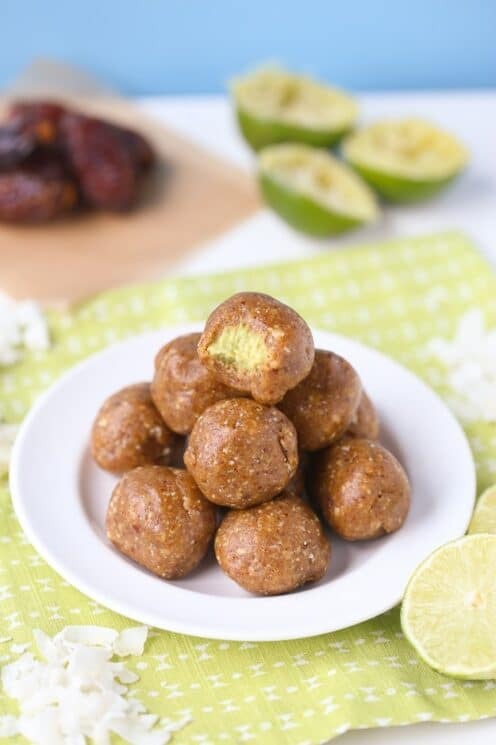 Enjoy our Key Lime Energy Bites! Or try our Chocolate Orange Energy Bites! Remove the pits from your dates and add to a food processor with the coconut flakes and cashews; blitz to combine. The mixture should be thick. Remove from the food processor. Zest 2 of the limes and then juice all 3 limes into your food processor or blender. Add avocado, banana and coconut cream and pulse to combine until smooth. Pour into a bowl and place in the freezer. Meanwhile, roll out your date mixture onto parchment paper or take pieces and flatten into circles. 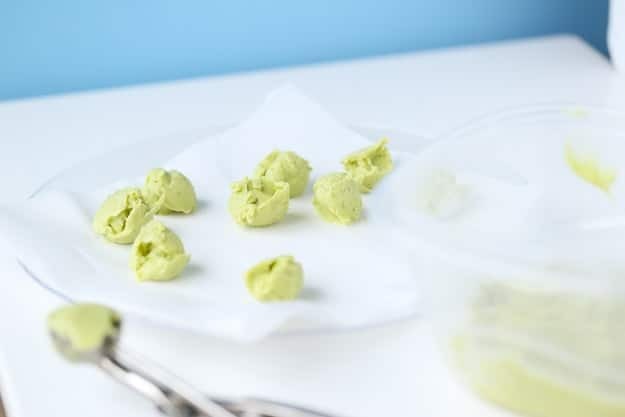 Once your lime filling has frozen enough to scoop, scoop out small balls (a little bigger than a teaspoon) and place them on a plate. Freeze again. 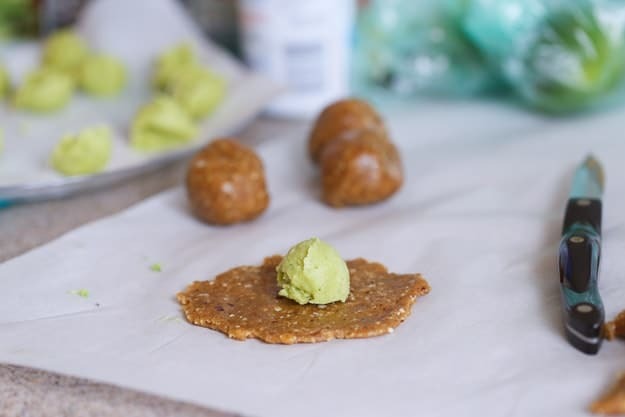 Place each frozen ball of lime filling on circle of date mixture, then wrap the date mixture around the filling. Remove any excess and gently roll into a smooth ball. Place back on the plate and freeze until ready to serve. Repeat for each energy bite. To serve, remove from freezer a few minutes before eating. Enjoy! Do you have a suggestion for a substitute for cashews? My son is allergic, but he’s ok for other nuts. Thanks! Can you suggest a suitable replacement for dates? Hi, I made these and used regular limes. The filling turned out really tart, even after assembling with the shell. Do you have a remedy for this? Should I have used key limes instead? Thanks!